We saw Angie Feret follow us on Instagram and creeped her profile. Here was a female motorcyclist, also from Toronto, working in a motorcycle dealership, and out doing some cool and colorful stuff. Half way through a 200km bike ride. Infusing creativity into every aspect of my life, and approaching situations with the heart of an artisan. My amazing friends and family, my bike, and food food food! YouMotorcycle: Tell us a little about yourself, in your own words. Angie: I am an artist, a model, a lover of the outdoors. I am free spirited and easy going. Sometimes I find it hard to decided between riding my bicycle and riding my motorcycle to work (and some days the longboard). I could ride any of these options for days straight and be the happiest girl in the world. I like dressing up for shoots, for comic book conventions, for parties, whatever! I am a workaholic who rarely sleeps. YouMotorcycle: When did you decide to start riding motorcycles, and how did you get into it? Angie: I WANTED to start riding when I was 16, but lack of time, money and motivation delayed this until over a decade later. My ex girlfriend sold me her old scooter, and I rode that for over a year. But when that died, I was in need of a vehicle QUICK. My younger sister was looking to upgrade so she sold me her Yamaha Virago (named Vera). I rode it every day from Toronto to Oakville about 3 hours of riding per day, rain or shine. My riding improved very quickly. I was also forced to learn a lot about bikes due to a slew of difficulties I had with Vera – probably from riding her way too hard. YouMotorcycle: Sounds like we had similar paths. I started off on a scooter before taking on an ’85 Honda cruiser that required a lot of love… which taught me how to ride and how to wrench at the same time. Angie: I love the DIY aspect as well! I like doing maintenance myself. I always feel so accomplished once I figure something new out. YouMotorcycle: What are you looking for next? Angie: I’m currently looking for an affordable/reliable bike in the range of 500cc. My poor little 250 has served me well, but I need to ride further! 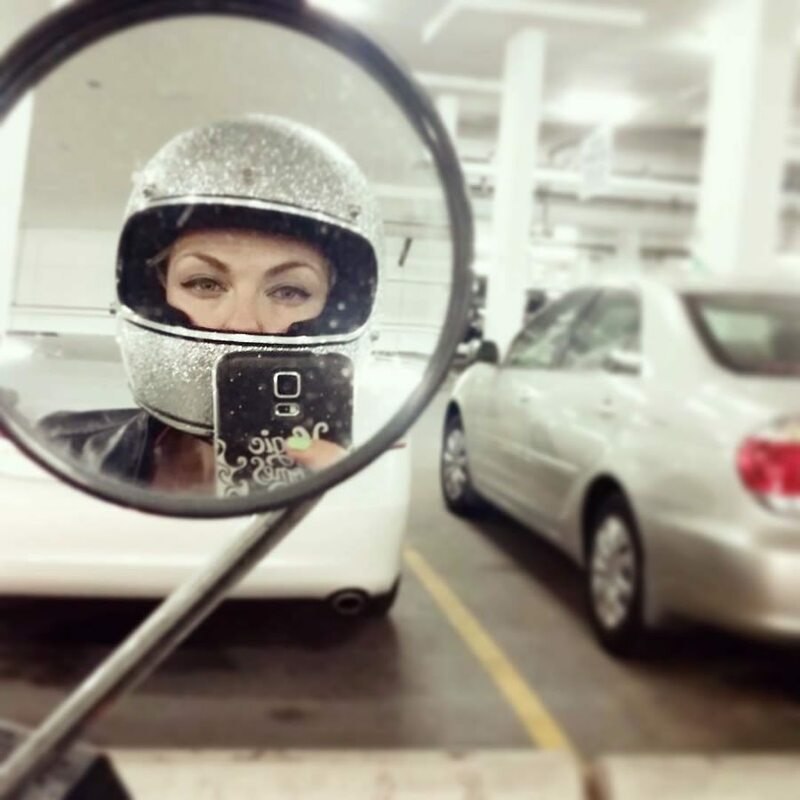 YouMotorcycle: How’s the Toronto motorcycle scene treating you? Angie: I love the motorcycle community. It makes me feel like I am part of the coolest crew in the world. The comradery and sense of belonging is overwhelming. People are always willing to lend a hand, a truck, a tool, or pass along a phone number of someone that can help you out if you are in need. I found some cool guys on Instagram and started going to meet ups. I love how passionate everyone is and how much they love their bikes as if they were their children. Especially the guys I know that build their own bikes. Angie: I would LOVE to build my own bike. Right now I am engulfed with design and modelling work, but I took this job at the shop on Saturdays (even though I really don’t have the time – or even the need for it) because it serendipitously arose. I hate to pass on wonderful opportunities that not only allow me to accumulate skills and connections, but are also so in line with my interests. If I ever abandon Motion Design I know it will be for something like motorcycle mechanics. YouMotorcycle: How has motorcycling played a role in your life as a woman? Angie: I really try to challenge gender roles. I tend to gravitate more towards “masculine” interests. This gets pointed out a lot in most areas of my life. It is, however, a bit conflicting for me. Sometimes I find it frustrating that I get the whole “good for you” when people find out I ride. Not that they are meaning to be condescending in any way – I guess I am just surprised that it even has to be noted when a female rides a motorcycle. But on the other hand, sometimes I feel a huge sense of empowerment. I know that I myself even get excited when I find other female riders. Like in some way I’m proving that I can do anything I want to, regardless of what society thinks. Follow Angie on Instagram for fun goofing around pics, photo shoots and pin up shots, and shameless selfies.